St. Cloud Soo Bahk Do® martial art school hosted a morning only, week-long camp summer camp June 16 – 20th for kids and teenagers. Thanks to Master Nelson's advance arrangements, camp attendees enjoyed visitors from St. Cloud Police Department, St. Cloud Fire Department, Gold Cross Ambulance, and the Central Minnesota Area SWAT Team. Participants learned about history, lineage, Korean and Chinese culture and personal safety. 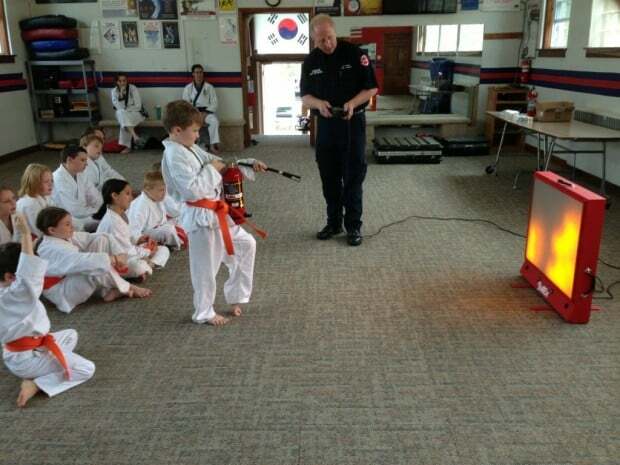 Each student created a Korean flag and performed many repetitions of kicks, punches, forms and self defense techniques in preparation for a rank exam the week after the camp. The camp concluded on a high note with attendees celebrating with their families, enjoying pizza and graduating from the camp. If you'd like to host a fun, exciting and educational multicultural event for your group that also teaches personal safety, then call today and book your date (320) 252-8726.